Once you have the SMS feature enabled, there is very little configuration needed to get up and running. The most important part is supporting the auto-logging aspect to Salesforce. When a text message is sent from or received to Jiminny, an activity is automatically created in Salesforce under the appropriate record. 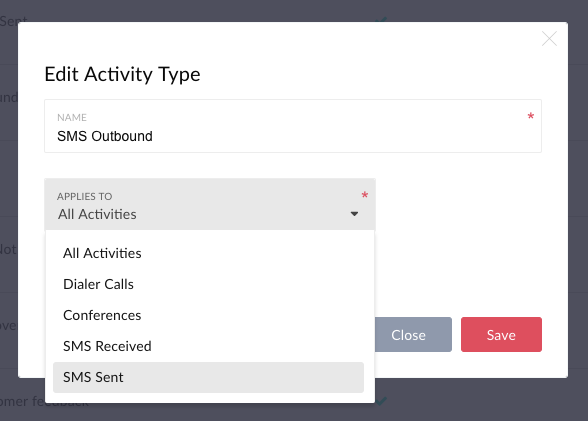 For tracking purposes, we also set the activity type depending on the direction of the message (inbound vs outbound). Follow the instructions below to add your new activity types. If you have already configured these, note down their names and skip this part. Follow the instructions provided by HubSpot to add your new call/meeting types. You'll need 2 new types, the names are up to you but we recommend SMS Sent and SMS Received. If you have already configured these, note down their names and skip to the next section. For each playbook, follow our guide to setup your two new Activity Types in Jiminny. When doing so, make sure you select the correct values for Applies To. SMS Received should map to your inbound option in the CRM, SMS Sent should map to the outbound option. Once these are setup, well automatically assign the correct type to the text message.